Firstly, don’t be fooled by the UK quad poster (adorned with biohazard insignia) and casting of Cillian Murphy – for better or worse, Carl Tibbetts’ debut feature Retreat (2011) is in no shape or form a suitable partner piece to Danny Boyles’ infected horror 28 Days Later (2002). 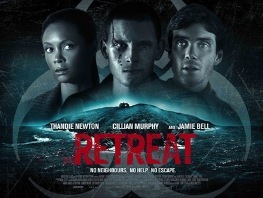 Starring the aforementioned Murphy, Jamie Bell and Thandie Newton, the film is instead a surprisingly dull chamber piece severely lacking in tension, suspense and intrigue. Retreat follows journalist Kate (Newton) and architect Martin (Murphy), a ‘young professional’ couple whose relationship appears to have been fractured by an as-yet unknown personal tragedy. Heading off for a relaxing few days on a familiar – yet isolated – island retreat somewhere off the coast of the UK, the pair soon find themselves cut off from the outside world thanks to a temperamental generator. Their attempts at establishing communication are irrevocably shattered when an unknown man (Bell) in a bloodied military uniform is washed ashore, bringing with him news of an airborne viral epidemic that is sweeping through Europe. The key dramatic pivot upon which Retreat’s narrative rests is whether Bells’ unhinged ‘soldier’ is who he says he is, or if his outbreak is simply a ruse to gain control of the lodgings (and its unfortunate occupants) for his own sinister ends. However, by the time we get to the great reveal, its significance has been rendered almost inconsequential by the previous 85-or-so minutes of clichéd dialogue, muddled narrative and tame psychosexual fumblings. Newton is the real disappointment of the film, looking sorely out of place alongside Hollywood regulars Murphy and Bell. Despite middling roles in Crash (2004), Run Fatboy Run (2007) and W. (2008) she never manages to spill out her dialogue with anything other than a gentle disdain. Murphy’s involvement is even more baffling, coming in as he did to replace Jason Isaccs in the role of Martin. Thanks in no small part to The Dark Knight Rises (2012) director Christopher Nolan, Murphy is now a major player in both the States and at home, yet finds himself trapped in a windswept house in the middle of nowhere with an uptight journalist and – what appears to be – a paranoid schizophrenic. You suspect his flight back out to Los Angeles can’t have come quickly enough. Despite some occasional cinematic flourishes, Retreat is ultimately scuppered by a weak, unimaginative script and three uninspired central performances. For a debut director, Tibbett clearly has some pulling power amongst the UK acting echelon, but his next effort needs to be substantially meatier if he is to compete with the Ben Wheatleys and Paddy Considines of this world.